Looking to learn a little more about Sister Rosetta Tharpe before seeing Marie and Rosetta? Here is brief timeline of the life and music of this trailblazing and and influential artist! Marie and Rosetta is on stage Nov 23-Dec 30. Buy Tickets Here! 1915 Rosetta Atkins is born in Cotton Plant, Arkansas, on March 20. Soon after, mother and evangelist preacher Katie Bell Nubin separates from her husband and relocates Rosetta to Chicago. 1920s-30s Rosetta performs with Katie Bell at Fortieth Street Church of God in Christ. The duo tour Chicago’s Maxwell Street market and the Church of God in Christ (COGIC) circuit of the South. Her acclaim as a gospel singer and guitar player grows. Jamecia Bennett* as Sister Rosetta Tharpe. 1934 Marries COGIC preacher Thomas Tharpe. 1938 Joins revue cast at the Cotton Club and records her first Decca record, “Rock Me.” Throughout the late 30s and 40s she tours Carnegie Hall, the Apollo Theater, Cafe Society in New York and the Grand Ole Opry. She befriends and performs with Cab Calloway, Count Basie, Dizzy Gillespie and the like! 1942 Records Victory(V)-discs and performs for African-American troops during WWII. 1943 Divorces Tharpe. Marries Foch P. Allen. 1944 Releases “Strange Things Happening Every Day” with Decca, reaching #2 on the “race records” chart. 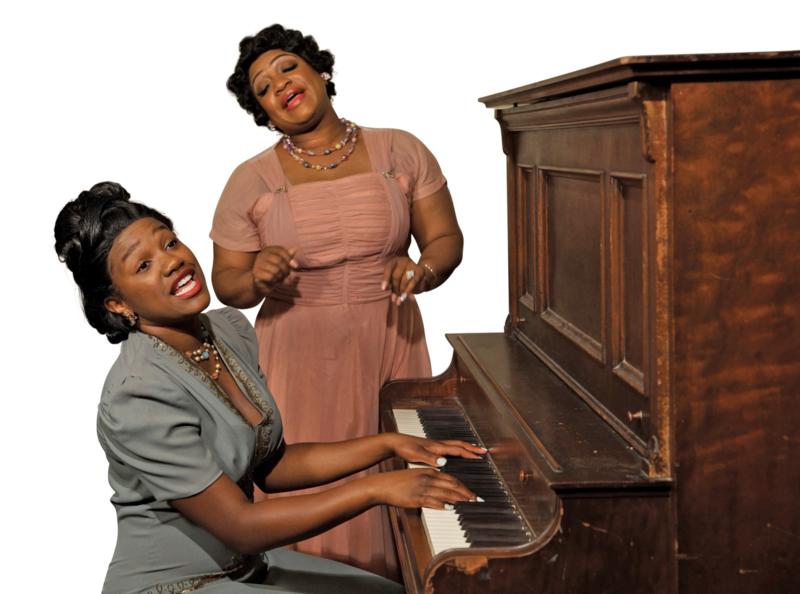 Rajané Katurah Brown as Marie Knight, Jamecia Bennett* as Sister Rosetta. 1946 After a concert at Harlem’s Golden Gate Ballroom, where gospel singer Mahalia Jackson invited up-and-comer Marie Knight on stage, Tharpe convinces Knight to join her act. 1947-1951 Divorces Allen. Tharpe and Knight tour and record several hits. During this period of touring, Knight’s two children die in a house fire. In 1951, the duet part ways. 1951 In a publicity stunt, Tharpe stages a wedding at Griffith Stadium in Washington D.C. to Russell Morrison. Knight is her maid of honor, and the Rosettes, a group of back-up singers formed by Rosetta in 1949, serve as bridesmaids. Over 20,000 paying fans are in attendance. After her vows, she plays a concert on electric guitar in her wedding dress. Decca live records the ceremony and concert, then releases it as an album. 1957 Tharpe and Morrison travel Great Britain and Europe at the height of the British blues revival. 1964 She books the Folk, Blues and Gospel Caravan tour in England, and performs in an abandoned railroad station for a live audience and nationwide TV broadcast. LINK. 1968 Katie Bell dies in Philadelphia. Tharpe receives her only Grammy nomination for the 1968 LP Precious Memories. 1973 Tharpe dies on October 9 in Philadelphia, following a stroke, where she is laid to rest in an unmarked grave. Knight performs at her funeral. 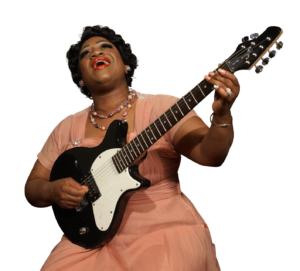 2007 Writer Gayle Wald’s biography, SHOUT SISTER SHOUT, The Untold Story of Rock-and-Roll Trail Blazer, Sister Rosetta Tharpe, kicks off a renewed period of interest in Tharpe’s life and music. 2011 A historical marker is added to Tharpe’s Philadelphia house. Filmmaker Mick Csaky produces the documentary The Godmother of Rock & Roll. 2018 Tharpe is inducted into the Rock & Roll Hall of Fame under its “Early Influence” award.